Waterton is a large real estate investment and management company headquartered in Chicago. We are currently working with them on their multi-phased office expansion. 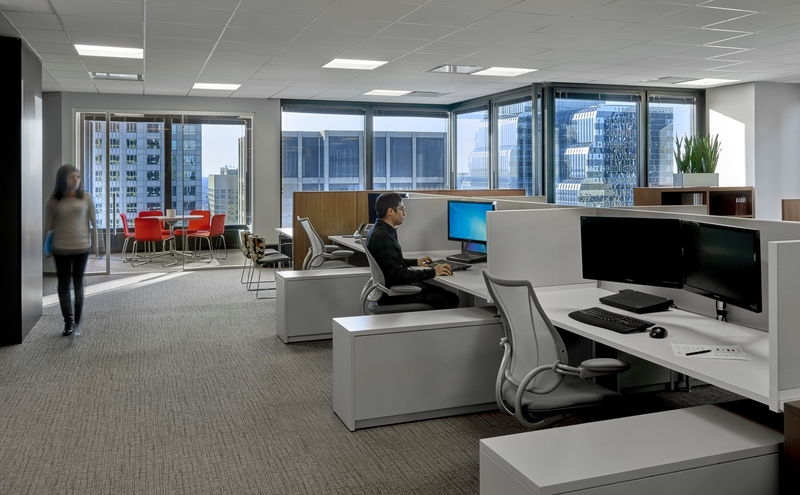 The first phase expanded their office into neighboring tenant space giving Waterton exclusive use of their floor at 30 South Wacker Drive. The prime downtown location offers excellent mass transit connections. 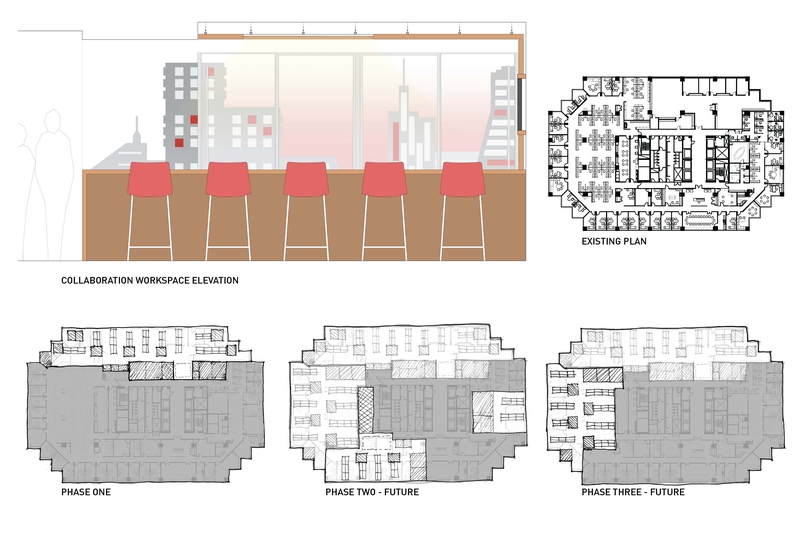 The annex allowed a fresh look at how workspace was allocated relative to transforming office culture and technology. New workstations open up to the windows and views of the skyline, providing natural light for all employees. Every other row of desks terminates with a low manager workstation, which allows additional storage and casual meeting space. Lining the inner core is a block of support spaces including phone rooms, conference rooms, a kitchenette, and informal presentation space. A series of floor to ceiling graphics present a stylized collage of the company’s real estate holdings while defining the core and providing varying levels of transparency into the spaces within. Room scheduling software was integrated into the conference entries to maximize efficiency and equitability of meeting space. Conference rooms were also equipped with video conferencing equipment. 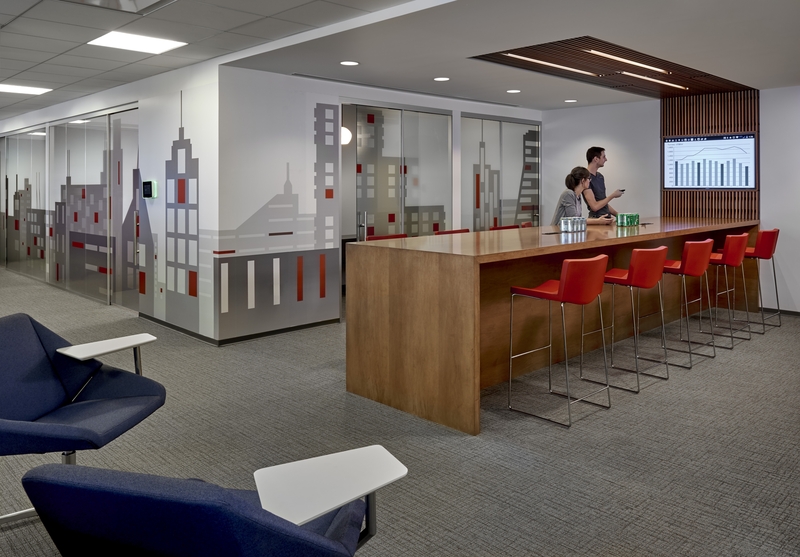 Their pre-expansion office lacked meeting space, so moveable partitions were installed between all new conference rooms for the flexibility to accommodate large or small meetings. Adjacent to the kitchenette, a standing height communal table with idea paint on the opposite wall, serves multiple functions such as collaboration space, overflow lunch seating, area for socializing, or simply a place to work away from a seated desk for a short time. Furnishings were chosen for their flexibility and durability but also to define a distinctive corporate image. The open office concept anchored by a support block will be mirrored on the opposite end of the floor as the future phases are implemented.